Tripp Lite Metered Power Distribution Units give IT Managers the ability to monitor network power consumption levels to prevent mains, generator, UPS or PDU overloads and to ensure proper load balance in complex redundant power applications. 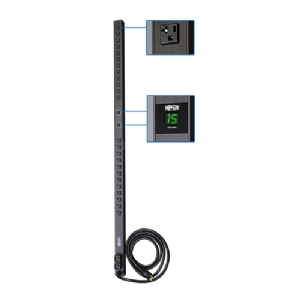 Each built-in, easy to read, two-character LED display offers continuous PDU current monitoring data in one-amp increments. Switch-free unfiltered electrical pass-through reliably distributes UPS or generator power to multiple servers and vital networking equipment in rack enclosures, network closets and more. Toolless mounting enables simple installation in button-mount compatible racks. Included mounting brackets support vertical installation in standard 2 and 4 post racks or other surfaces, such as under-counter or wallmount configurations. Plug retention brackets keep vital equipment plugged in and continuously powered. PDUMV30 63.75 in. 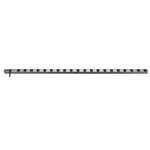 vertical 0U metered rack PDU supports 30A maximum capacity at 120V (agency derated to 24A). 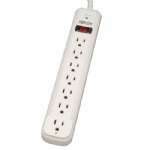 Includes 10-ft. attached line cord with L5-30P input plug. 24 5-15/20R outlets support networking equipment with 5-15P or 5-20P input plugs. Outlets are arranged in two separately metered and breakered 20A load banks (each with 12 5-15/20R outlets). Set of 2 built-in 2 character displays offer continuous information on PDU power consumption for each of the two built-in loading banks. 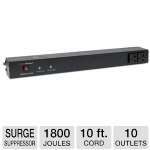 120V 30A Metered Power Distribution Unit (PDU) in 63.75 in. 0U vertical form factor. Overload protection -	Outlets are arranged in two separately breakered load banks. The top 20A breaker covers outlets on the upper half, the bottom 20A breaker covers outlets on the lower half of the PDU. Each breakered bank covers 12 5-15/20R outlets. 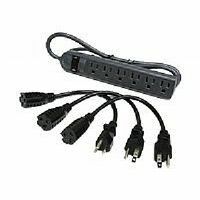 Input cord length -	10 ft.
Front panel LEDs -	Includes 2 built-in 2-character LED meters to display power consumption of items plugged into each separately breakered 20A loading bank.